I spend a lot of time every day looking at a terminal window, and over the last decade I had been tweaking my bash profile to make the terminal act, and look, the way I wanted it to. As a systems administrator in a former life, I had collected a bunch of “useful” scripts that would help me work on a variety of operating systems, from Solaris, to AIX, to SGI, as well as various flavors of Linux (CentOS, Fedora, Ubuntu, SUSE, Gentoo, etc.). I had aliases to commands (and my common typos) to log on to servers, control various services in my local development environment, and override common commands I typed all the time (e.g. 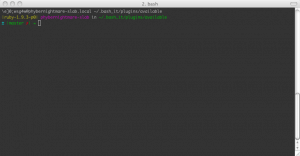 ss for rails server) in my .bashrc which was symlinked to my .bash_profile due to an OS X quirk. This has resulted in a really long bashrc file (nearly 2000 lines long), and I wanted to take some time to clean things and get rid of a lot of the legacy cruft that was in that file. In my personal workflow, I try to stay in the terminal as much as I can, finding the cognitive shift from a text-based environment to a GUI rather jarring. Imagine that; I connect my MacBook Pro with its two graphics cards to a 24” monitor, yet most of my “work” is done in a terminal (I do use the graphic card for its GPU regularly though). Since I spend so much time in the terminal, I not only wanted to get rid of the cruft, I wanted to do a bit more to make the environment look as good as this computer performs. I had been intrigued by the oh-my-zsh approach of bundling some themes and plugins. While I have used Zshell in the past, I never quite found the tab-completion, auto-correction, or the improvements to the scripting language compelling enough to make the move from Bash. However, being able to share a history across sessions and the built-in pager and globbing features almost got me there! These two lines clone the bash-it repository to a hidden directory (.bash_it) for your user account (/Users/[your user name]/.bash_it) then launches the installer script. Using hidden directories (.bash_it) hides the directory from Finder, but still gives you access to the directory with the Terminal app. The installation script backs up your current ~/.bash_profile file (if you have made any adjustments to it), then prompts you for the features you want. I answered ‘some’ to most of the questions in the installation script to choose which plugins and aliases you would like to enable. I don’t use emacs or nginx on a regular basis, and use rvm over rbenv, and it turns out the xterm plugin causes some issues on OS X, so I left those out. The default theme is named Bobby and looks really nice. It uses solarized colors and had one feature I really like: multiline feedback. On one line, I know which Ruby version I have active in RVM, the server I’m on, and where I am on the system. On the second line, I know which git branch I’m on, and if there are uncommitted changes (red x if there are changes, green check if everything is committed). I had quite a few aliases in my .bash_profile that I had created over the years. There were, however, some nice additional aliases included in the bash-it package to shorten some typing of commands. They included some common mispellings (yes, that was on purpose); most of the git aliases I had been using anyway, some useful aliases for heroku, homebrew (yeah bup), for opening various applications like Firefox, Photoshop, and Chromium, and some nice features for todo-txt. This isn’t something that the bash-it library deals with, but important in customizing the experience. The default font for the Terminal in OS X is Menlo. It’s a fine system font, but can get a little difficult to read at the distance I sit from my monitor. A really popular font for developers is Inconsolata. I changed my font to Inconsolata 14pt, and it has a very nice look to it. In Snow Leopard, the Terminal app doesn’t support 256-bit colors. Apple has updated Terminal in Lion to support this, but I have not yet upgraded to Lion. Quite honestly, the Lion machines I have dealt with have had ‘issues’ getting the tools I use on a regular basis installed, and I have just not had the time to deal with upgrading yet (most of the issues involve issues with XCode’s removal of gcc in favor of llvm. There is a good work around, and I believe the issue has been resolved in recent updates to XCode). There is, however, an awesome Terminal app replacement named iTerm2 that has a lot of the features I want; 256-bit color support, full-screen mode, ability to split the screens, and hot keys (please don’t make me click when I can type). After installing iTerm2, I can now run the tests for prism and get all the NyanCat rainbow awesomeness. Next up? I think I may write either an rsync script that will push any local changes to the various servers I use, or maybe even use the Dropbox client on Linux to symlink these files in, ensuring as soon as I make a change on my local development environment, they will be on the remote systems as well. Cite this post: Wayne Graham. “Customizing Bash”. Published March 02, 2012. https://scholarslab.lib.virginia.edu/blog/customizing-bash/. Accessed on .